It's only 2 kms (1.3 miles) each way, but it's a good uphill walk to get there once you cross the river! Luckett Vineyards only opened in 2010. I guess Luckett Vineyards is an upscale winery. It's a beautiful property, well landscaped, and with beautiful views. Upscale prices as well. We didn't partake of any of the offerings ($2 a pound for apples?) but a tour bus arrived at the time and we noticed that those people had no shortage of money! Beautiful views from Luckett Vineyards. And an old British phone box in the middle of the winery. The phone even works! Interesting shop to wander around, but $20 a bottle is out of our price range. Our daughter Lindsey says that you can get two free tastings, but we didn't see that mentioned anywhere. But I admit that we didn't ask, so perhaps they are available free. We did see a sign that said you could have 5 tastings for $7...again, out of our price range. The wineries we have been to in the U.S. have free tastings. Not sure why it's different here in Canada. Either way, it's an interesting place to visit even if you only come up here to wander around and enjoy the views. 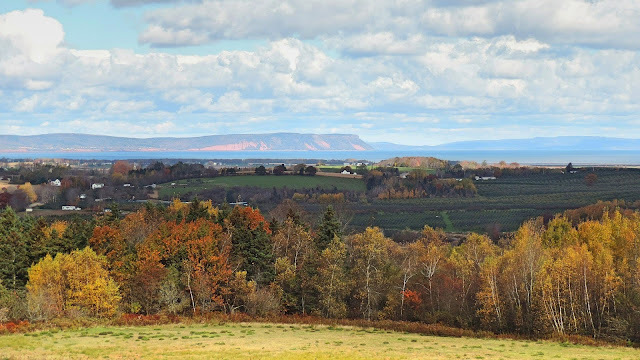 View of Gaspereau Valley and the Bay of Fundy. There's a tour bus that operates out of Wolfville that would be kind of fun. Unfortunately the season for this ended on October 13th or we would have done it! They take you to several wineries in the area, and that way you don't have to worry about drinking and driving. Info here. Oh, good news on another note...we have been accepted by a couchsurfing host in New York City. We'll be staying in Upper Manhattan about two miles north of Central Park. Really excited about meeting our host there next weekend! We have always enjoyed the winery tours and free tastings,but not so much the upscale places, like you its not in our budget. Have fun in New York City. We have always enjoyed them too, even the upscale places, just as long as they don't try to pressure you into buying wine you don't want and we have never had that happen so far. 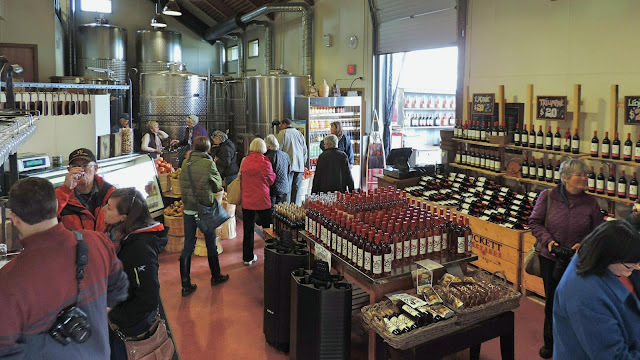 I haven't tasted wines in California's Napa-Sonoma wine country in years; but I remember it used to be an issue because lots of people really took advantage of the free tasting and became quite inebriated. I think most places have put limits on the tastings. We often went to the town of Sonoma on Sundays, stopped and bought a bottle of wine, Sonoma cheeses and sour dough bread and picnicked in the town park where the kids could play and we could relax for a whole afternoon before heading back (about 40 minutes) to our 'real' world. We have no problems with them putting limits on the tastings but they should be providing you with at least 2 or 3 samples free. We have been to a couple of places which actually charged you to do a tour and it wasn't cheap either, needless to say we didn't do the tour. I know one of these was a whiskey distillery up in Cape Breton, NS. We don't drink wine so we really haven't visited very many vineyards. Some are interesting to visit just because they can be in such pretty locations or have really impressive buildings. Um ya. Twenty bucks a bottle is out of my price range too. Interesting that everyone and their dog is making wine these days. But that's kind of awesome, really. It'll be interesting to see what, or if anything happens if this deal goes through with the EU (some sort of "free trade" thing) . Looks like we'll be able to get some decent cheese. Hopefully it'll be the same for wine. And at a decent price, but I doubt it. Lindsey did say that she has tasted their wine before and said that it was very good but it is still a little too steep for us. Maybe Kevin and I should start up a vineyard! I some how doubt that if the EU "free trade" deal goes through, that it will affect our wine prices. Oh, and I wonder if they'd be interested in being part of "Harvest Hosts", although that parking area looks too steep for an RV. Actually the parking lot was much flatter towards the back, an RV wouldn't have a problem getting in there. That's great news that you have found a couch surfing host in NY. There used to be a local winery here and often on Fri afternoons the staff from my work would head down for the tour and free wine. I understand the restrictions but you would think they'd still offer small samples. Enjoy the rest of your time in NS. Yep, we are pretty happy with finding a couchsurfer in NYC and in a great location for getting around to things in the downtown area. Most wineries only give you a small sample even when you do have to pay. I wonder if the day will evr arrive when we can buy wine from other provinces in BC. We never realized that you couldn't buy wine from other provinces in British Columbia. Strange that they don't allow that. We are looking forward to our visit in NYC. Not sure that our son will be happy with us if we are wearing a Yankees hat! We did go to one of the divisional games between the Yankees and the Oakland A's back in 2000 and we loved it! The last couple of times we went wine tasting in the Santa Barbara and SLO areas almost everywhere charged for tasting and had a specific program of what order you were supposed to taste what wines in. I think it has become a major part of their income stream. I prefer a nice craft brewed beer anyway where the small tasting serving is called a pint . We agree with you, it does seem to be the trend these days with charging for the samples in real big wine making areas. With the look of their buildings and houses, I think that they wouldn't suffer too much if they charged a very small fee. There definitely seems to be money in the wine business. Kevin would certainly agree with you on the beer tasting and most places we have been too give you at least one full pint. Another great reason to visit Nova Scotia! 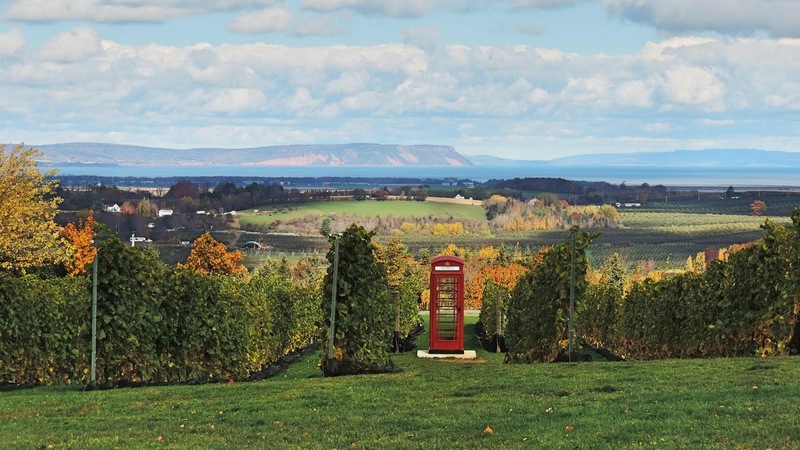 They do make some nice wine in the Annapolis Valley that is for sure! I'm not a wine drinker but that sure is pretty country. I really want to go back to Nova Scotia, it is just such a beautiful place. If I could only figure out how not to have to throw out my giant herb plants in order to bring them back into the states. Such a stupid rule for plants that came from the states in the first place. Your border guards are a lot nicer than ours. I know you and David would love it here. Perhaps you can find someone that could look after your herb plants while you are up here and then just pick them up on your way back. Seems a shame to let that stop you from visiting here. Your amazing pics and tours of Nova Scotia have enticed us to revisit the province next summer. Thank you! I hope we have inspired you enough to do just that!